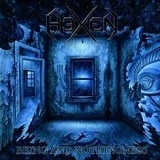 Prior to the release of this album, Hexen was one of those bands with a lot of potential and not much output. In 2008, these LA thrashers snuck up on the metal world with State of Insurgency, a tight debut that showcased their excellent instrumental skills and knack for catchy riffs. It wasn’t perfect, but it was the sort of album that makes you sit up and notice a band, with a mind to keep an eye out for any future releases. So now that they’ve finally released their second album - after lengthy delays - the first spin was an experience for which I was possibly more nervous than excited. Despite all the potential, four long years of waiting and an increasingly unstable line-up put a pretty big dent in my confidence. At this point, a strong follow-up was hardly guaranteed. What a pleasure it is, then, to announce that Being and Nothingness is exactly the sort of album I hoped Hexen would deliver. What makes it so satisfying is that the band manages to retain all of the aspects that made their debut so much fun, but instead of resting on their laurels they have made a conscious effort to refine and build on that sound. The resulting album is therefore neither a rehash of former glories, nor a misguided attempt at reinvention. Instead, the best possible outcome has been achieved, and that is a true realisation of potential. A heavy focus on technical, melodic guitar solos remains the cornerstone of Hexen’s approach to thrash, a fact which I whole-heartedly welcome since these guys are pretty damn good at playing their instruments. The solos represent most of the highlights on the album, much as they did four years ago, but the big difference here is with regards to all those other bits in between, or in other words, the actual songs. The song writing has come a long way between now and then, and the album feels much more cohesive and rewarding as a result. Hexen have always leaned towards the more melodic side of thrash, but here it is taken another step further with a distinct NWOBHM influence on the riffs felt throughout the record, particularly on such tracks as Defcon Rising, Stream of Unconsciousness and The Nescient. I think it would be remiss of me not to make specific mention of bassist/vocalist Andre Hartoonian, whose passion for the Hexen project really infiltrates the record. Aside from being the primary songwriter, he is also a very talented bass player and makes his presence felt. He knows when to give the songs a bouncy sense of fun with a Harris-esque gallop, but displays enough skill to match the wizardry of his guitarists (check out the intro to Stream of Unconciousness). Lyrically, he once again explores introspective and socio-political themes, which is interesting enough compared to the usual aimless aggression. He employs harsher vocals than last time around as well, making the whole delivery sound more thrash appropriate. It’s pretty easy, all things considered, to recommend this album to fans of thrash. While not exactly prog, the song structures are interesting and varied enough to reward repeated listens for quite some time and the playing is technical and impressive. Even so, the band never forgets that the songs should always remain fun, catchy and aggressive. As far as contemporary thrash goes, that’s a pretty damn solid package.